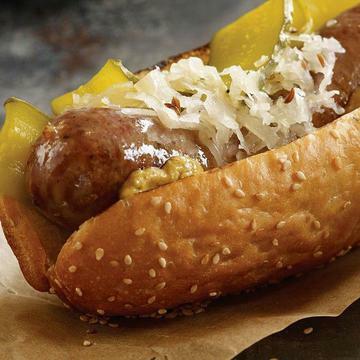 You'll love the flavor of our fully cooked, lightly seasoned bratwurst. A delicious blend of pork and beef make these an absolute grilling favorite and keeps them popular for family meals all year long. Serve these sizzling from the grill with a pile of the best-ever steakhouse fries seasoned with cracked black pepper and sea salt. Better order plenty! Meal serves 4. Thaw in refrigerator.�Grill: Grill over medium high heat for 8-10 minutes.�Stove-Top: Pan fry in skillet over medium high heat 12-14 minutes.�From Frozen:�Stove-Top: Boil in saucepan, from a frozen, 14-16 minutes and 12-14 minutes if thawed. Microwave: Microwave from frozen on medium high power for 2 - 2 � minutes. Do Not Thaw!�Oven: Preheat oven to 450�F. Remove fries from packaging and place on a baking sheet with lined parchment paper or foil lightly brushed with oil, leaving space in between. Place sheet in oven on center rack. Bake for 18-20 minutes.�Grill: Preheat grill to medium. Remove Omaha Steakhouse Fries from plastic packaging and place on a perforated grilling pan. Heat over grill for 15-20 minutes, stirring constantly.